The 2013 honorands with President Spencer. From left, Vivian Pinn, speaker Gary Hirshberg, Elaine Hansen, William Cronon and Spencer. Photograph by Phyllis Graber Jensen/Bates College. In business, the environment and government, “the bottom line is that many of the so-called experts have been wrong and now need to be second-guessed,” the co-founder and chairman of organic yogurt maker Stonyfield Farm told the Bates College Class of 2013. 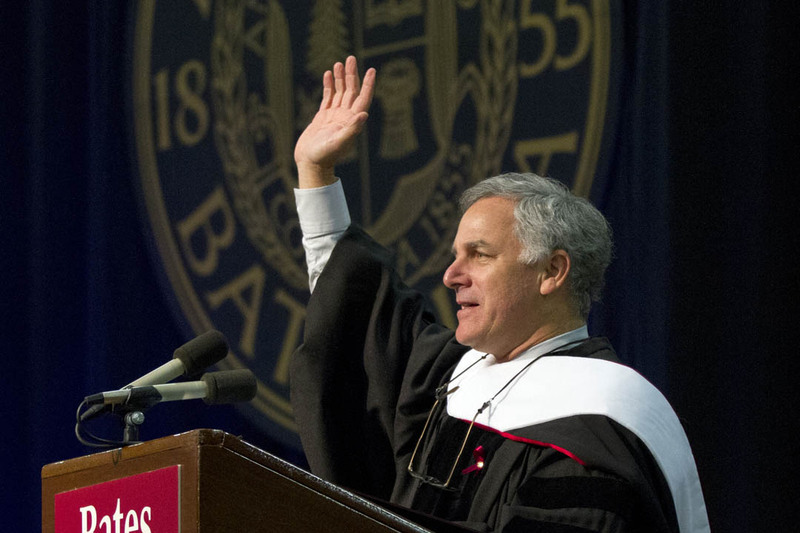 Gary Hirshberg was the featured speaker at the May 26 ceremony, held in Merrill Gymnasium, that started a new chapter in the lives of 436 Bates seniors. 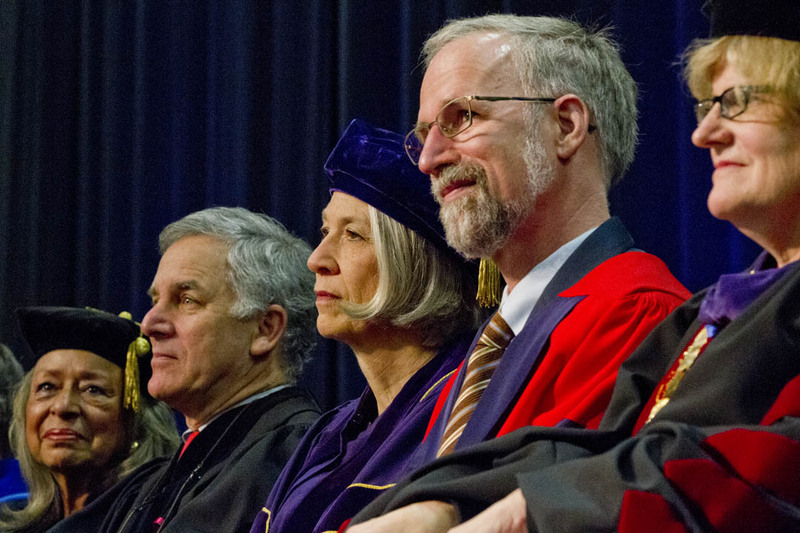 He also received an honorary degree, along with environmental historian William Cronon, Bates President Emerita Elaine Tuttle Hansen and Dr. Vivian Pinn, inaugural director of the Office of Research on Women’s Health at the National Institutes of Health. Class of 2013 by the numbers. Professor of Sociology Sawyer Sylvester (left) and retiring Dean of the Faculty Pam Baker ’69 just prior to Commencement. Photograph by Phyllis Graber Jensen/Bates College. The event was a milestone for at least three people besides the graduates and their families. It was Clayton Spencer’s first graduation as sitting president of the college. 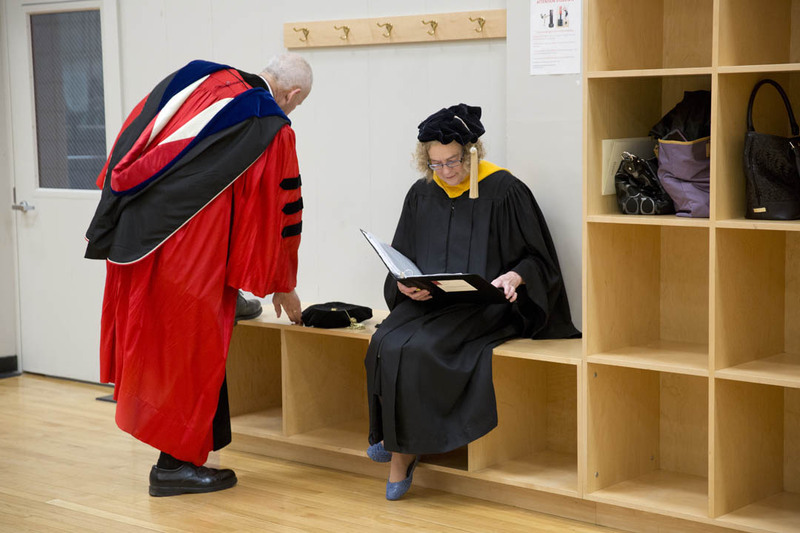 But it was the final commencement for Pamela Baker ’69, vice president for academic affairs and dean of the faculty, and Multifaith Chaplain Bill Blaine-Wallace, both of whom are retiring from Bates. The Sunday morning ceremony also presented a milestone in giving to the college. As reported to the gathering by Senior Gift chairs Nancy Weidner and Hank Geng, the Class of 2013 hit a new Bates record for participation in the senior class gift, as 400 seniors, or 92 percent of the class, donated nearly $18,000. If the weather fell short of ideal, warm feelings abounded within Merrill. Spencer’s welcoming remarks spread the good feelings around, drawing warm applause with a request that the graduates show some love for the people who supported them in all ways through their Bates years — families and professors, for sure, but also members of the Lewiston-Auburn community, and the college staff “whose work on campus makes our lives possible, and whose work made this ceremony possible” (a reference to the need to move the ceremony indoors). In still another milestone, a graduating senior spoke at Commencement for the first time in at least half a century. Tommy Holmberg, a history major and Bates actor-director from Winnetka, Ill., was selected by a Commencement committee from a field of three finalists nominated by classmates. 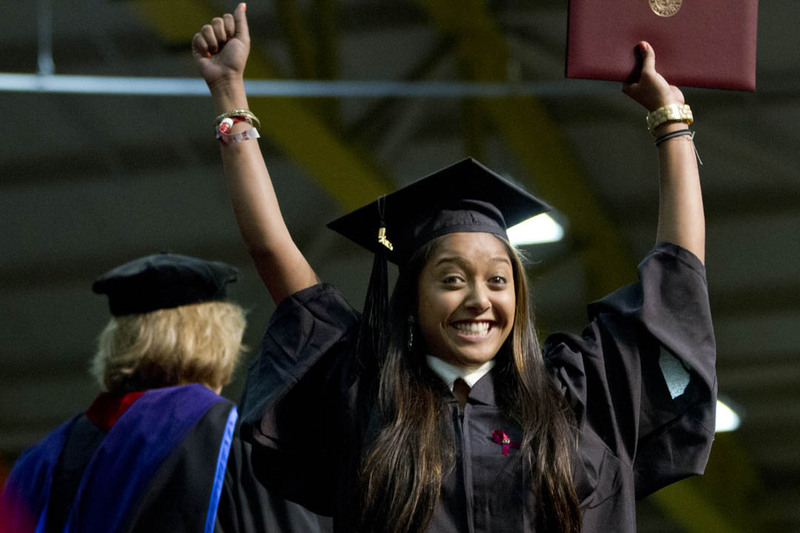 An exuberant Zaihra Ahmed ’13 shows off a product of four years’ hard work at Bates. Photograph by Phyllis Graber Jensen/Bates College. After today, he said, “We will be intelligent, because of the ardor and devotion of the good people of this institution. We will be passionate, because Bates allowed us to follow our passions and realize our dreams. We will be fun, because we’ve had fun here. President of Bates from 2002 to 2011 and now executive director of the Johns Hopkins Center for Talented Youth, Hansen also received an honorary Doctor of Letters degree. As Bates president, she “helped us to dream well and take action on our good ideas,” Spencer said. Stonyfield Farm Chairman Gary Hirshberg is shown during his Commencement speech. Photograph by Phyllis Graber Jensen/Bates College. Drawing lessons for the graduates from his experiences getting Stonyfield off the ground, Hirshberg’s address was funny, folksy and plainspoken. But if the tone was light (speaking of milestones, this may have been the first-ever mention of camel dung in a Bates Commencement address), the thrust of his message was anything but. 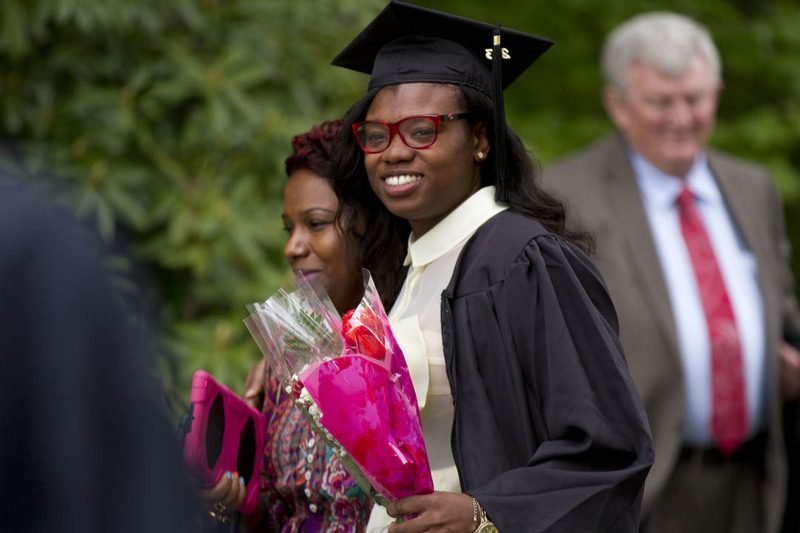 Basia Braboy ’13 and a family member walk toward Alumni Gymnasium for a post-Commencement luncheon. Photograph by Phyllis Graber Jensen/Bates College. Hirshberg held out four pieces of advice, illustrated with tales from the precarious early days of Stonyfield Farm — now a business topping $350 million in annual sales. Finally, show up. “Never underestimate the value of performing service and doing good,” said Hirshberg, who previously had praised Bates’ efforts in community engagement and the senior class Pledge of Social Responsibility. “May you have the courage to listen to the voice of desire / That disturbs you when you have settled for something safe.